The information gathered on the IRS tax form 1040 captures a lot about an individual’s financial situation. The forms can also be used for talking points with a financial professional. Consider using the form to launch a variety of planning discussions. 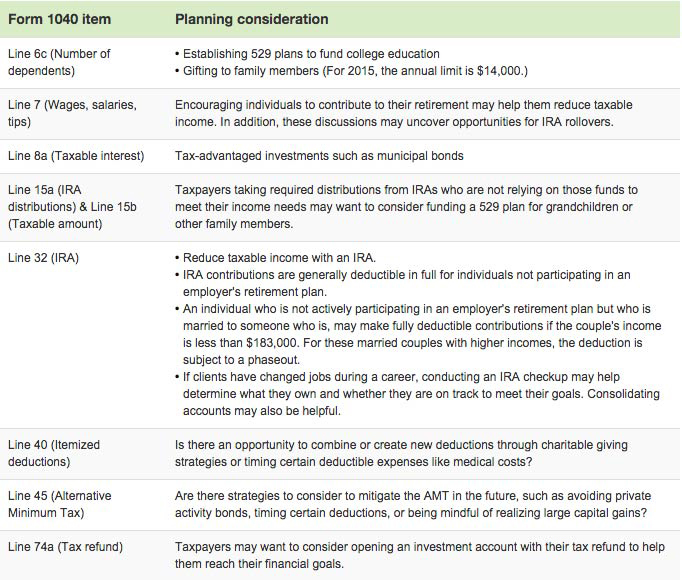 The following table illustrates how line items on the 1040 can lead to specific planning opportunities. For additional information, Putnam has a series of Investor Education articles. More details about the AMT are highlighted in “The alternative minimum tax: Tax-saving strategies,” and “Should you consider a rollover IRA?” is a helpful document when engaging in an IRA checkup.